Poor Pisa. 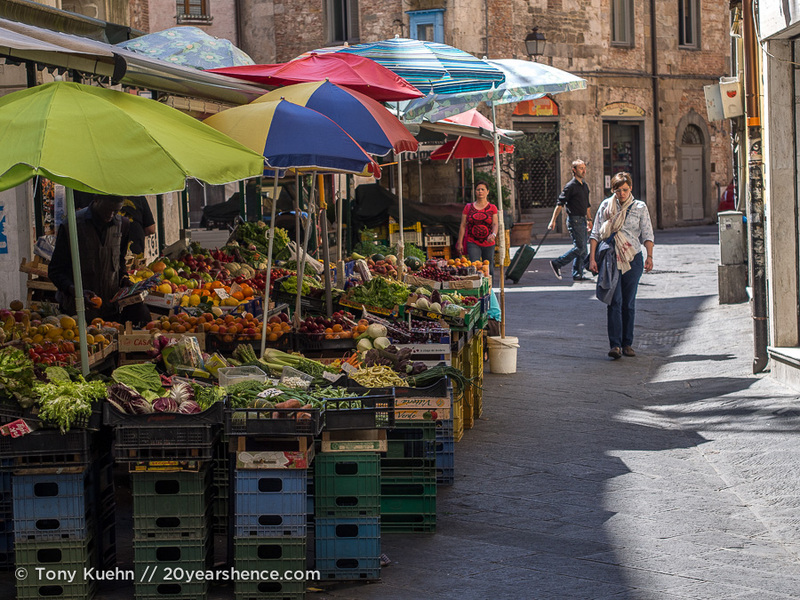 One of Tuscany’s most popular daytrip destinations, this compact city is generally touted by travelers as being worth nothing more than a quickie. Each morning, visitors are shuttled in by bus and train, flooding the Piazza dei Miracoli (Field of Miracles) where the city’s most famous historic buildings (the most noteworthy of which is, of course, the Leaning Tower) are found. 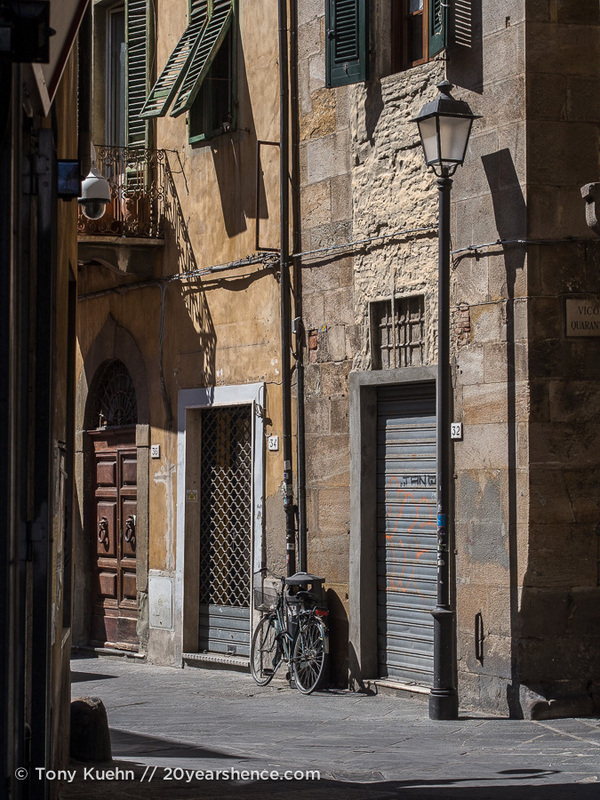 They poke around and take their pleasure for a few hours (which generally amounts to taking goofy photos and enjoying a “traditional” Tuscan lunch somewhere), before returning to Florence or Siena—cities with a little more on offer than a wonky tower. Hardly anyone sticks around for more than half a day. Indeed, most visitors opine that there isn’t much more to Pisa than her listing edifice and is otherwise so banal that she doesn’t even rate a one-night stand. Truth be told, we would have happily skipped Pisa altogether. The city was never really on our radar, as we had little to no interest in seeing its most famous landmark, both of us certain it was one of those things that was gimmicky, overhyped, and probably more impressive in photos. We were confident the city would be the quintessential tourist trap, filled with stores and restaurants devoted to wooing unsuspecting and undiscerning one-time visitors. We didn’t want to be part of the crowds. It seemed, however, that the universe had other plans for us. It turns out that Pisa is one of the cheapest gateways to Italy when flying from Paris: Our tickets only set us back €50/~$62US each, INCLUDING one checked bag. Although perhaps more romantic, a train ride across France into Italy would cost far more than this (seriously, train ticket prices in France are best described as “heart-attack inducing”) and take far longer than 2 hours, so kicking off our two weeks in Italy with a stop-over in Pisa was really a no-brainer from a logistical and budgetary standpoint. 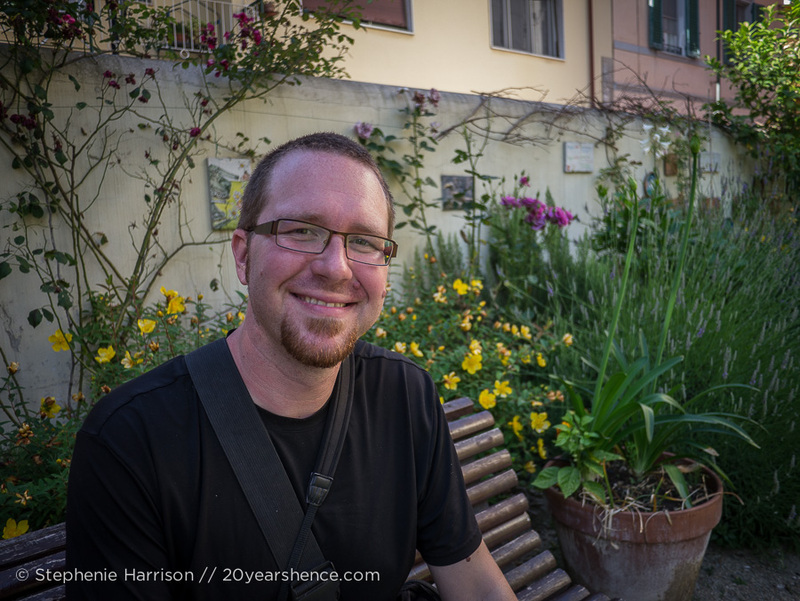 Once we purchased the tickets, it seemed foolish to arrive in Pisa and not bother to see any of the sights, so we hopped online to see if we could find a CouchSurfing host who might be a good fit for us and be willing to show us the town. When Irene, an awesome post-doctoral student at the local university, opened her home (and her futon) to us and said she could host us for a couple of nights, we suddenly found ourselves scheduling in a two-night visit to “Love It & Leave It” Pisa. 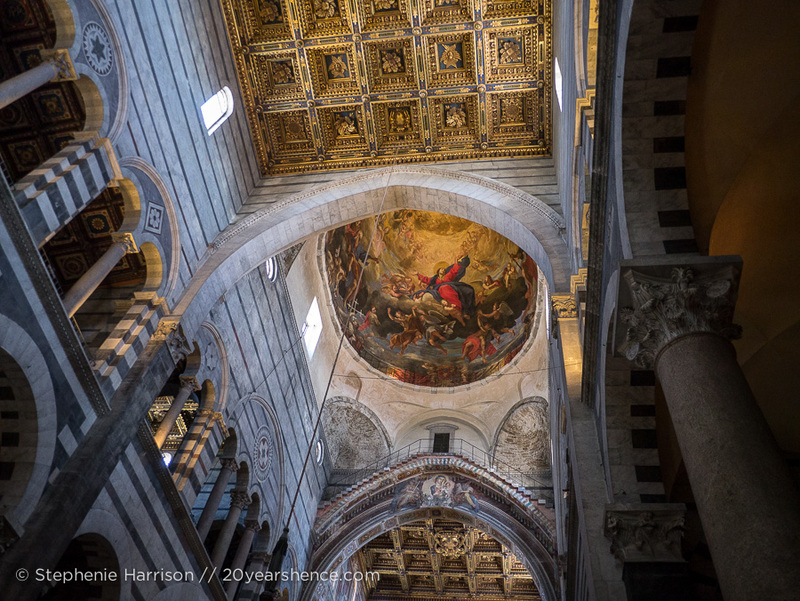 I have often found that Happenstance is a way better trip planner than I am, and Pisa was no exception. 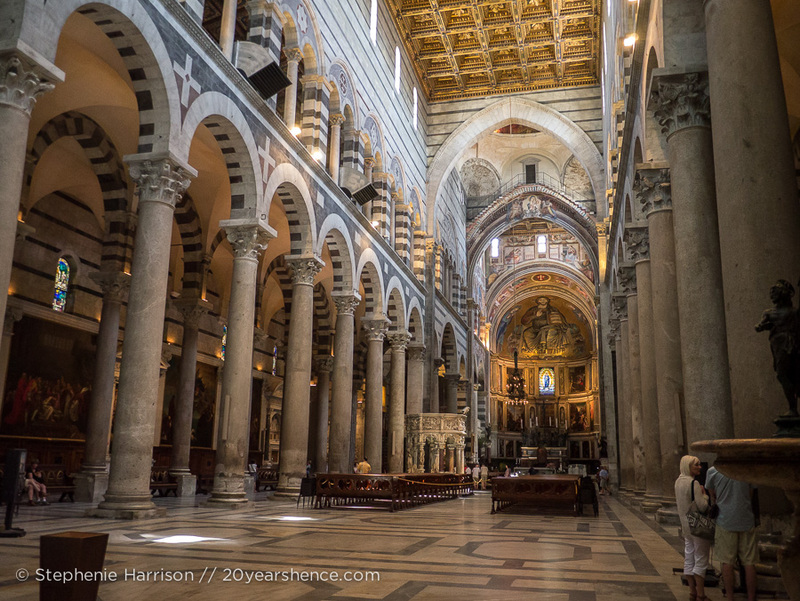 Far be it for a travel writer to denigrate other guides and blogs, but if I had listened to the popular wisdom found on the internet, we would have given Pisa a pass, or possibly only allotted it half a day of our time. Both of these options would have been a mistake for us because, quite simply, we found Pisa to be a delight. 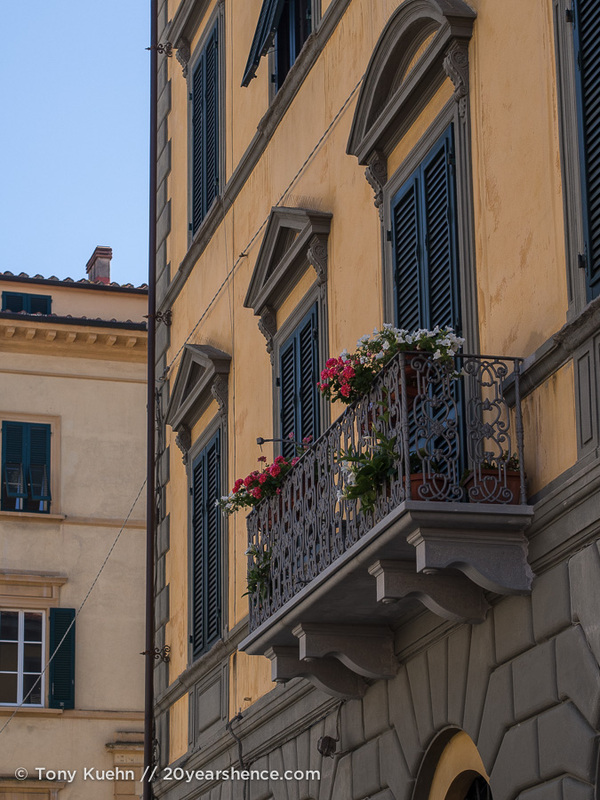 Far from finding the city crowded and overly concerned with catering to tourists, we found most of Pisa to be refreshingly down-to-earth and really pretty tranquil and chill. Most ironically given that it’s the reining queen of quickie visits, I know part of why we enjoyed our visit so much is because we spent more time than the average visitor in Pisa, not less. Let me explain: As I said earlier, most people race to Pisa in the morning and depart by early afternoon. 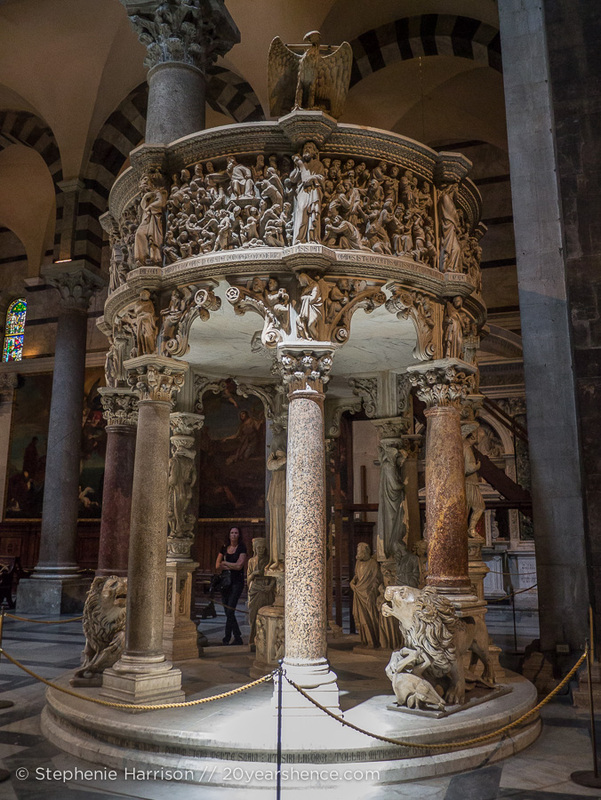 They make a beeline to the Leaning Tower, which is nestled alongside the city’s main cathedral, the ornately carved Baptistry, and an expansive Roman cemetery filled with sculptures and art. Between the hours of 9 am and 2 pm, this area of the city is, unsurprisingly, swarming with masses of your stereotypical tourists. All of these buildings are beautiful, by the way, so I don’t fault anyone for wanting to visit them. It’s just that it can sometimes be a bit much, and it can be easy to overlook the attractions for the tourism circus that engulfs them during the day. Visit later in the afternoon or—even better—late in the evening when there is little more than moonlight and a sky blanketed with stars to light the cobbled streets and the ancient buildings, and it’s a completely different experience. The busiest part of the city is now as silent as the grave, and the stark white structures feel ghostly against the velvet black night. Removed from the clamor of the crowds and the sale pitches of the vendors and touts, the structures can work their magic on you. As you stand in the shadows and gaze up, you feel the full force of their history, and their majesty slams into you in a way that the harsh light at noon would otherwise blind you too. One common report from tourists is that they are surprised by how small the Leaning Tower truly is, that it seems so much bigger in pictures. This is true. In reality, the Leaning Tower is not so much lean and elegant as it is stocky and kind of chunky. But when viewed at night, as it looms up out of the darkness, it really does seem larger than life. To get so close, with no one around feels like you’ve stumbled somewhere you’re not meant to be, like you’ve discovered a secret no one else knows about. Surely, the day-trippers will never know this feeling. Pisa’s Field of Miracles is impressive during the day, but it is at night that you really appreciate why this area is named as it is; at night it is nothing short of miraculous. I’m glad we gave Pisa more than a few hours, but I do understand why bucketlisters pop by Pisa and leave just as fast. It’s a small city that even the people who live there admit is really just a university town; Irene even recommended that rather than spend the whole day in Pisa, we might want to hop the train and check out neighboring Lucca for a couple of hours lest we get bored. Pisa may be little more than a quintessential working-class Italian village (albeit, a big one), but that was part of its charm for us (not to mention the fact that it’s actually a very pretty city). We loved that even at peak visiting hours, you could wander away from the Field of Miracles and the main drag with all the tourist shops and restaurants with menus in four different languages, and within five minutes, the crowds would drop to nothing and you’d find yourself in a largely local neighborhood where you’re greeted in Italian rather than whatever language the shopkeeper suspects you speak. 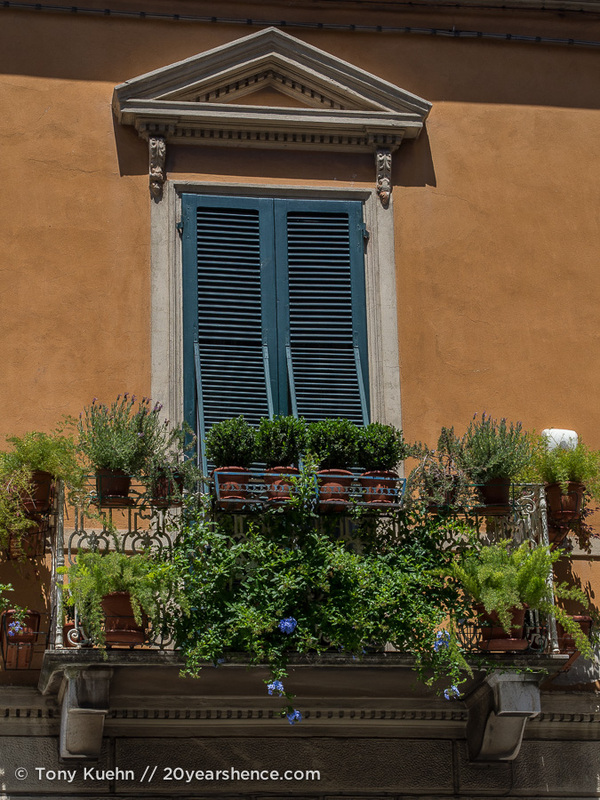 Pisans might argue that their city is nice but unremarkable, however we personally reveled in how Italian everything was. 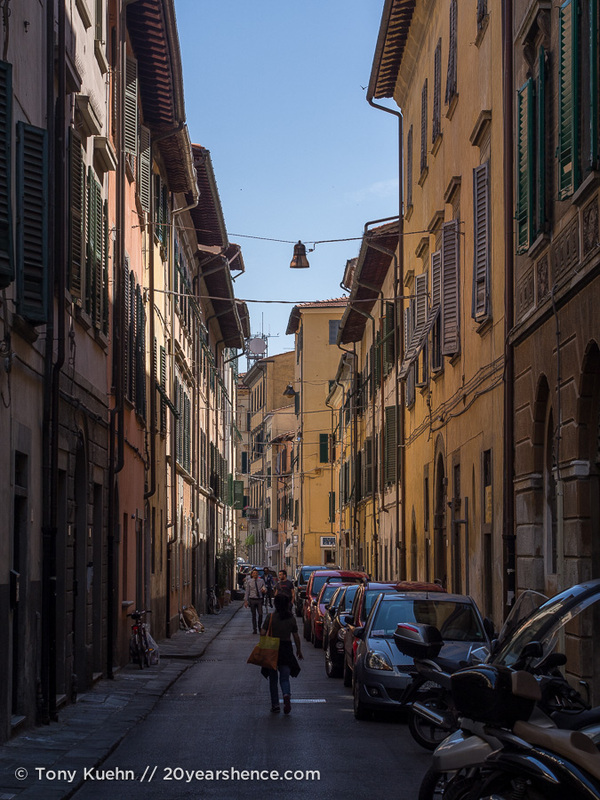 Having failed to fall in love with Paris, we traipsed through the back streets of Pisa with an added bounce in our step, luxuriating in the golden Tuscan sunshine and breezes that smelled downright crisp and sweet compared to the urine-tinged aromas of Paris. Traveling has taught us that even the mundane can be beautiful when it’s played out on a foreign stage. That sense of “otherness” makes the familiar fascinating. Our time in Pisa was spent strolling alongside the Arno and getting lost in the twisting maze of alleyways that snake from the center of town. 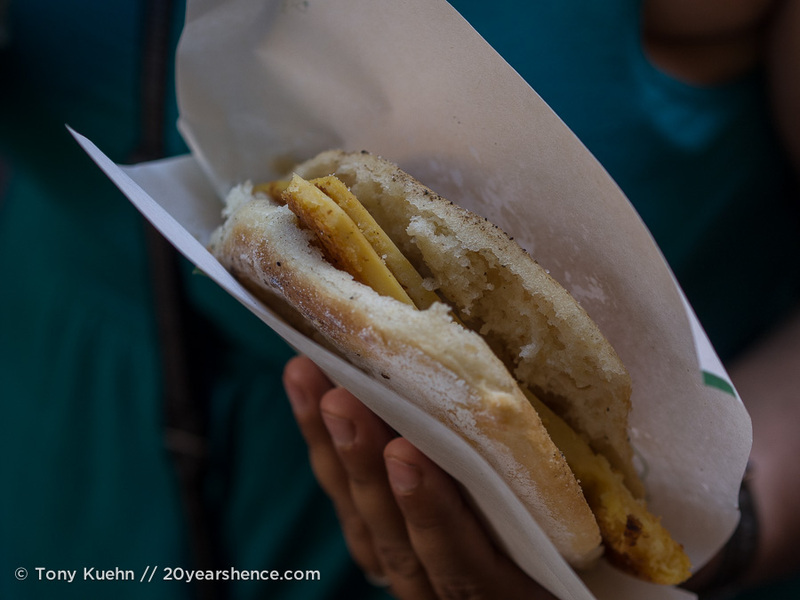 We browsed a local vegetable market, and then went to a popular haunt for penny-pinching students at lunch time and ordered one of the city’s few culinary specialties: chick pea fritters (a bit like polenta) snuggled into a chewy bun. 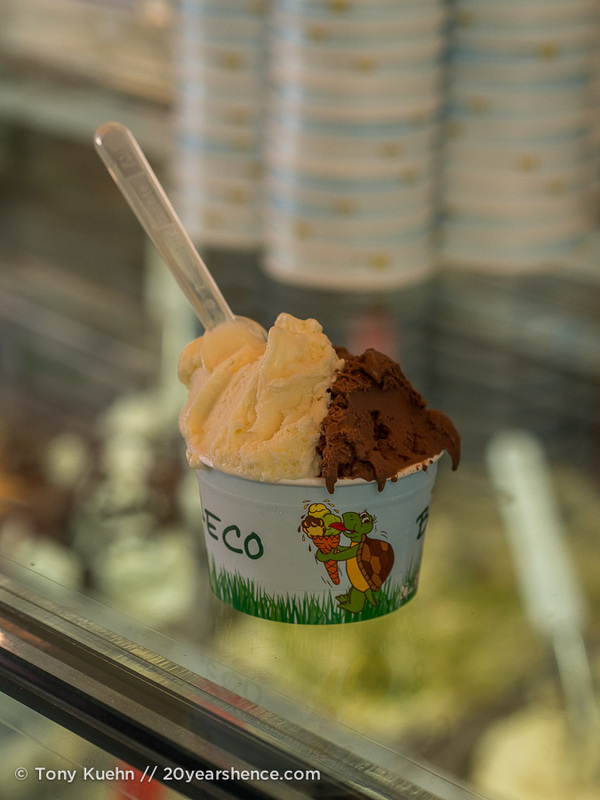 We shared gelato in a large green square, where we watched Italian lovers sunbathe and pack on the PDA. We rambled around town from the main train station out to the fringes of the center of town, our laughs echoing off the old stone buildings, until we stumbled into a quiet community garden (quiet, that is, until some kids joined us and began practicing their breakdancing!). There was more gelato (the line outside the gelateria—along with the perplexing flavor of the day “Zuppa Inglese” which we translated (correctly, but no more informatively) as “English Soup”—was too long for us to resist! Clearly it had to be good… and it was! Also, apparently Zuppa Inglese is an Italian dessert that, to our palates, tasted like egg nog. 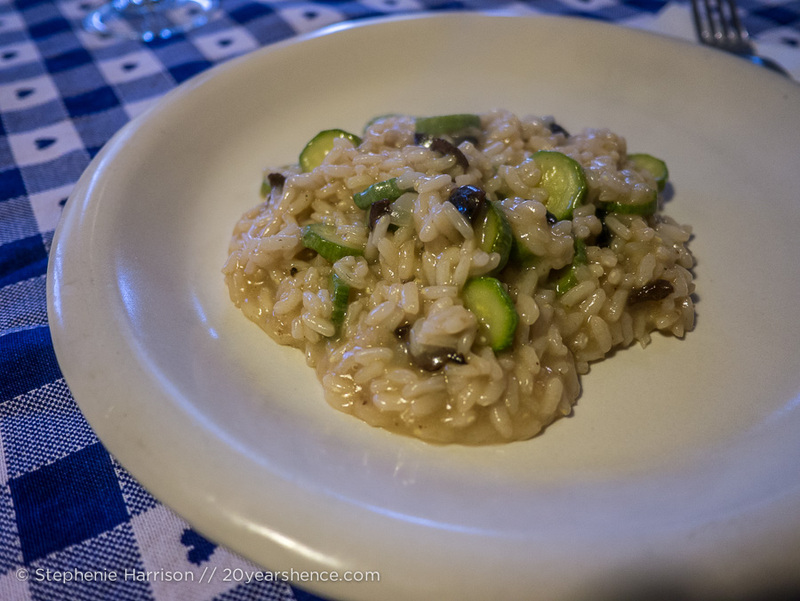 ), and late night visits to the best pizzeria in town (Pizzeria la Piccola Capri) that serves up Naples-style pies (or, in our case, a pizza/calzone hybrid), and crash courses at Irene’s apartment in cooking the proper risotto (garnished with olives from Irene’s home village down in the south of the country). 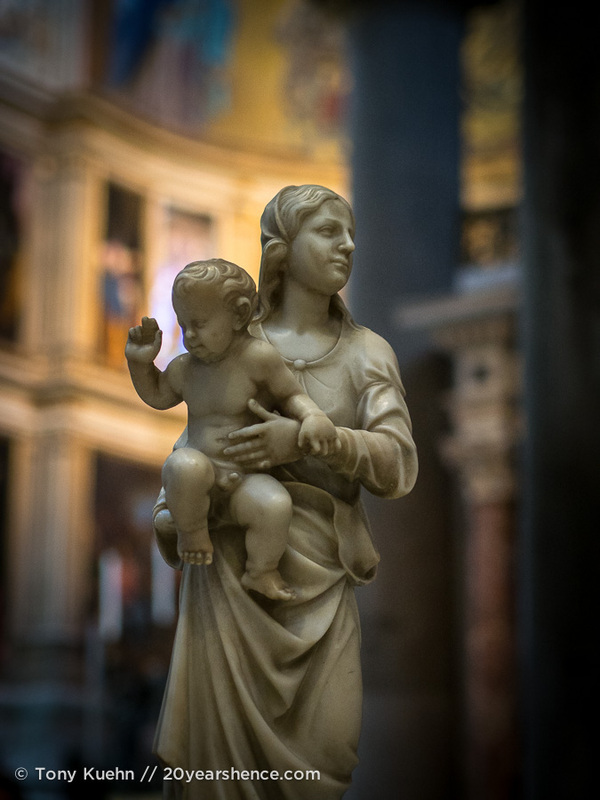 Our day and a half in Pisa was the kind you could probably have in any city—Italian or otherwise—but in places like Rome or Florence that are chockablock with “must see” attractions, you’re far less likely to indulge in the Italian specialty of dolce far niente. In Pisa, you’ll probably run out of obvious things to do by noon—we certainly did, and so we gave ourselves over to delicious idleness instead, and it was very sweet indeed. We never planned to visit Pisa, but on the road, often times things work out better than you plan them. 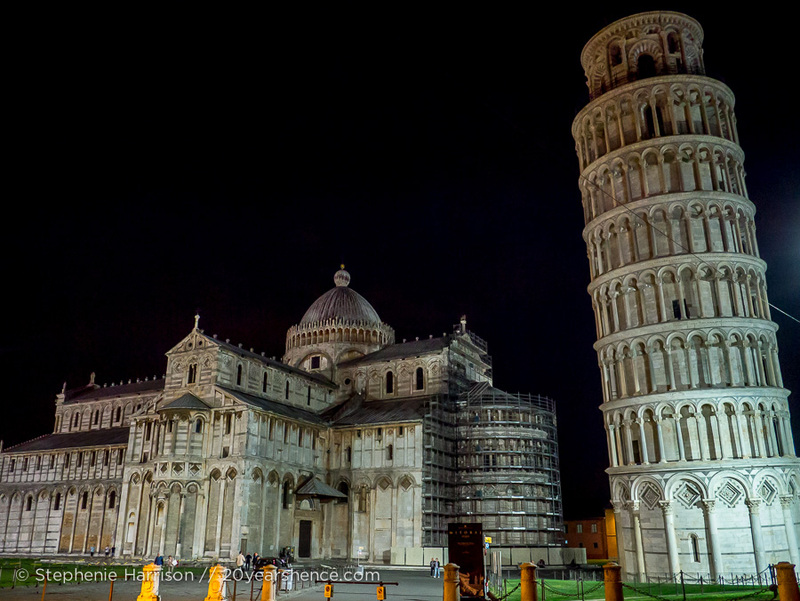 Pisa’s a great quickie, no doubt, but she’s an even better one-night stand. 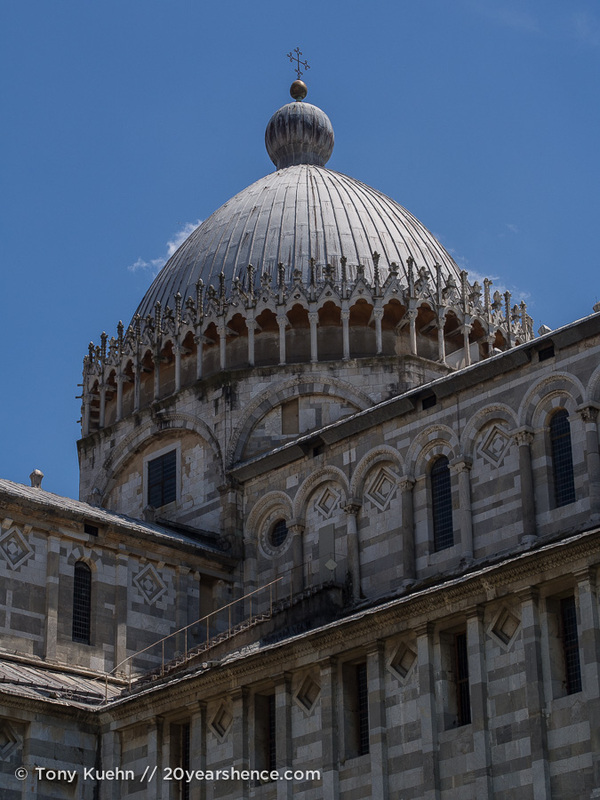 Her charms and attractions may not be obvious during a jam-packed race through the city on a deadline, but if you give yourself a little time to uncover her secrets, I think you’ll find a visit to Pisa can be one of extended pleasures. Now it’s your turn: Are there any popular day-trip cities that you believe are better appreciated with a longer visit? Have we convinced you that Pisa is worth more time than it normally gets? So great to read about your experience! On our recent trip, I talked Kevin out of going to Pisa (I know he just wanted a lewd photo to send his buddies), so I’m glad you gave it a chance and discovered that it’s a nice city. 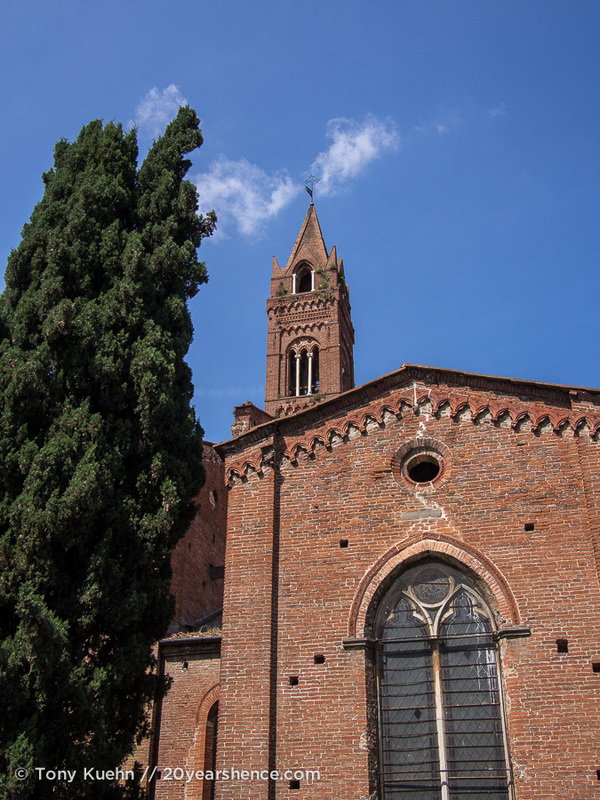 I felt the same way about downtown Modena, which is lovely, but doesn’t get many visitors. I liked it SO MUCH better than Venice, which was crowded and just really sad–a shell of its former self. Interesting to hear your thoughts about Venice—during our time in Italy, everyone kept asking us if we were going to Venice. When we told them no (it just didn’t fit into our itinerary), they kept telling us we had to go and that we should skip Pisa or Bologna instead. It’s somewhere I wouldn’t mind seeing some day, but I admit my fears about Pisa (overly crowded, a bit of a tourist trap) are ones that I know are true about Venice. Doesn’t mean it’s not worth visiting, but I think somewhere like Modena would be more our speed! I love this, in part, because I love Italy so much. 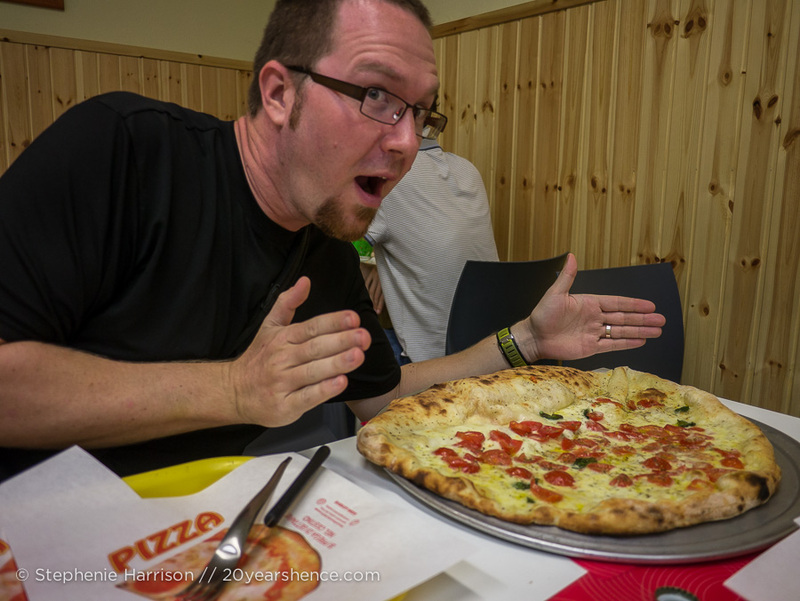 Admittedly, it was my first plane trip (or any trip) ever, but I’m a one-trick pony when it comes to Italy. I’ve been back twice. My “never going there” place was Venice, and then I went -just to stay the night- and stayed for three days. It helped that I wasn’t visiting at a peak time, but it was early May. The thing about Italy is that, yes, there are tourists, but as you say, if you step away from the most touristy areas, you’re still in for a magnificent treat. I can’t wait to go back. I’m glad to hear that you had a great time not just in Italy as a whole, but also in Venice. That’s another place on our “supposed to be great, but maybe too touristy for us” list: It looks so beautiful, but we’ve heard such horror stories about the crowds, it’s hard for us to get super excited about it. I definitely think that whenever we do visit Venice (because surely we will!) that we will need to visit in shoulder season rather than peak tourist season. I think you beautifully captured it and made me wish I stayed the night. Definitely more than just rocking up for a few quirky poses. 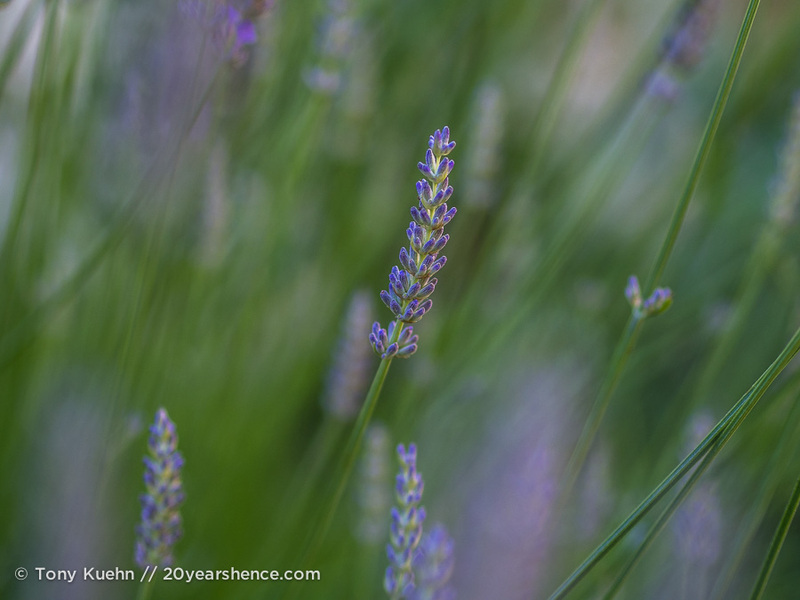 Jimmy Dau recently posted..The week in photos – Thirty Seven. Yes, getting to witness the Field of Miracles at night when it was all but abandoned was cool enough that I think people should stay at least one night in Pisa. Not everywhere feels so different when the sun goes down, but Pisa totally feels like a completely different city. Tim | UrbanDuniya recently posted..With Backpack Me: Travel bloggers’ favourite travel books! I think most people rush through the city not expecting there to be much because that’s what they’ve been told to expect, but there really is so much more to Pisa. I think spending 1.5 days there was enough for us because we got to enjoy it at all times of day (and night! ), but I hope you’ll get to go back & see at least a bit of what you missed on your last visit. 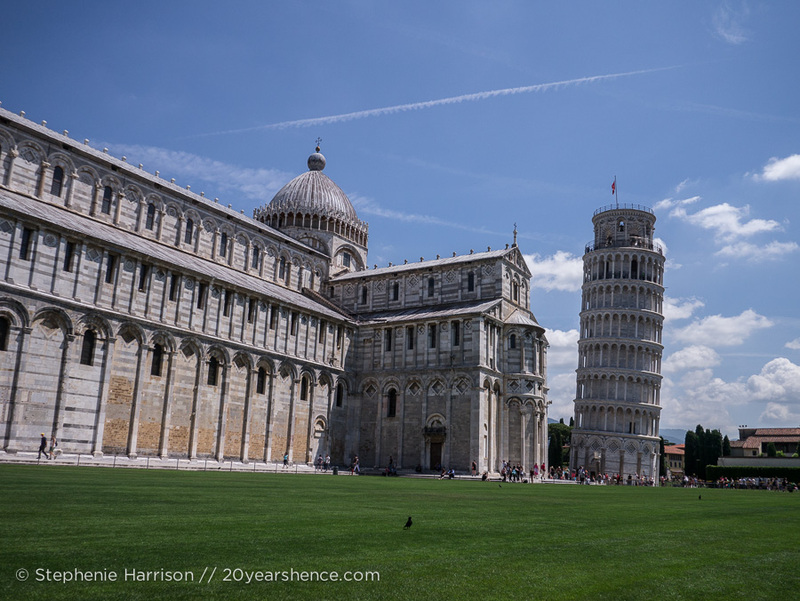 We totally did a quickie trip to Pisa from Florence when we were in Italy a decade ago. 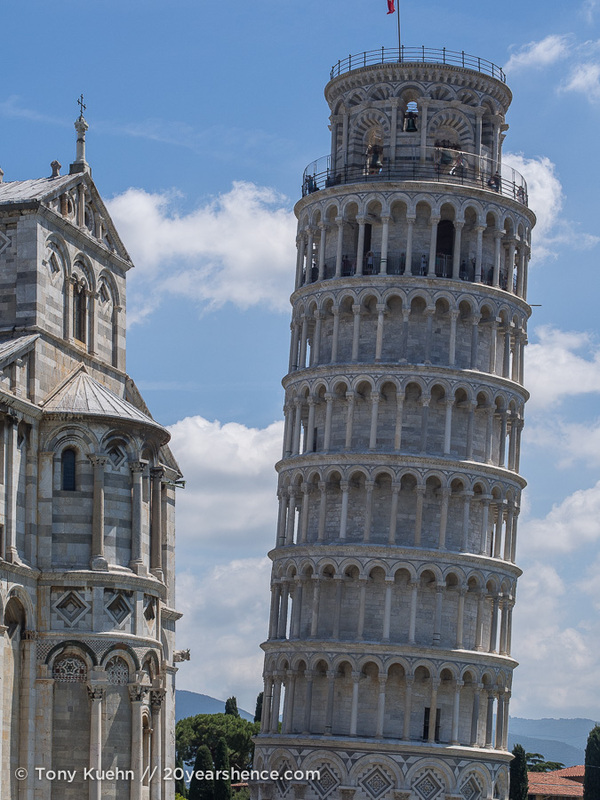 Granted, it hadn’t originally been on our radar until a Eurorail ticket checker failed to mark off one of our ‘trips’ thus giving us an extra travel day, but after reading this, I don’t think I would begrudge another stop to Pisa. Also – I can’t get over the night shot of the tower and Cathedral – it doesn’t look real! 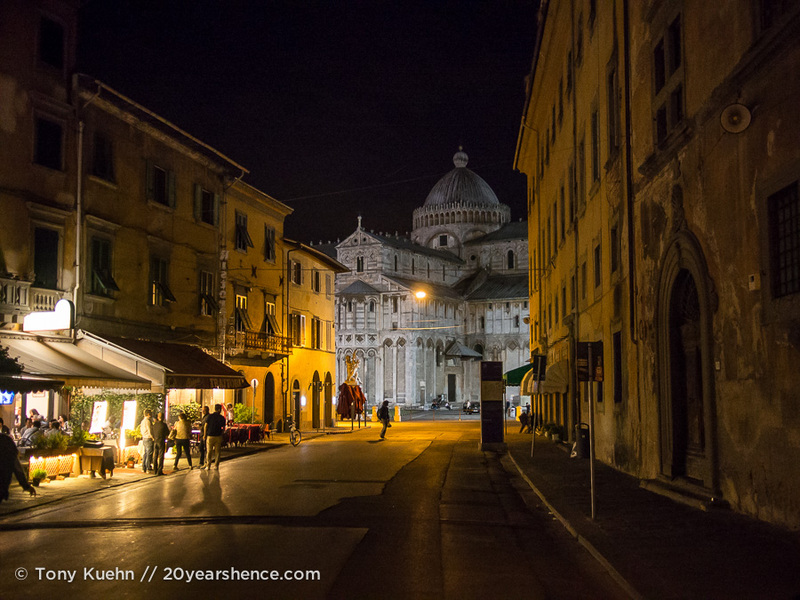 Looking back at our photos of Pisa at night, I agree with you! The tower totally looks like a weird model or something from Disney World/Epcot. I don’t know why, but it just seemed so crazy that you could wander right up to those buildings at night. For someone who didn’t care if she ever saw that tower, I admit I got chills when I first saw it at night! We only stopped in Pisa ourselves for about half a day when I was travelling through Europe in a van with friends in 2006 but I remember liking the small city a lot. I found too that if you wander away from the tower, you can quickly get away from the crowds and I remember finding a cute market to browse. I’m sure it’s true that in every city you can wander away from the main tourist attractions and find pockets of solitude and normalcy, but it seemed especially extreme in Pisa. By contrast, somewhere like Florence, it didn’t really seem to matter where we went for the most part—tourists always seemed to be around! We were so gung-ho to take trains around Europe because they are so notoriously good and convenient, but we took embarrassingly few because of the elevated costs. They were affordable in Italy, but in France & Spain, the costs were insane. Initially we were going to cut out Italy from our itinerary because the train costs to get there were so high, but then I found those crazy cheap flights and the rest, as they say, is history! Also, Pisa really surprised us, and I’m so glad it did. It was very cool to get to be there at night because the city has such a different flavor than it does during the day. Also, I think by staying with a local, we definitely got to see the less touristy side to the city early on, and that helped us continue to explore that side of things throughout our stay. OMG just don’t stay for a month! We decided to base ourseleves in Pisa from mid Oct to mid Nov so we could work & take day trips around Tuscany. The city goes from feeling like a city to feeling like the suburbs real quick. We felt trapped & isolated. You’re completely right, there is a lot more to Pisa than the tower. But stay as close to the center as possible, walking distance b/c the buses aren’t reliable & many routes stop by 8:30pm. And sure, stay for a few days. But not longer. You run out of quaint bits quickly. Maybe we just had a rough month of bad circumstances there. Like being in an apartment 10 mins from the center by bus & realizing how useless the bus was, & living under the flight path, & being too far from a good grocery store. We only took the buses twice: once from the airport on our first day, and once to the train station on our last day when we had all of our bags and didn’t want to walk. From the looks of it, it seems most people tend to ride for free, so I don’t think the buses are the citiy’s top priority; most people seem to walk or bike. I was so sad to read about your difficult month in Pisa. Obviously we enjoyed our time there, but we were there under very different circumstances and for a much shorter amount of time! I’m so glad you wrote this Steph. 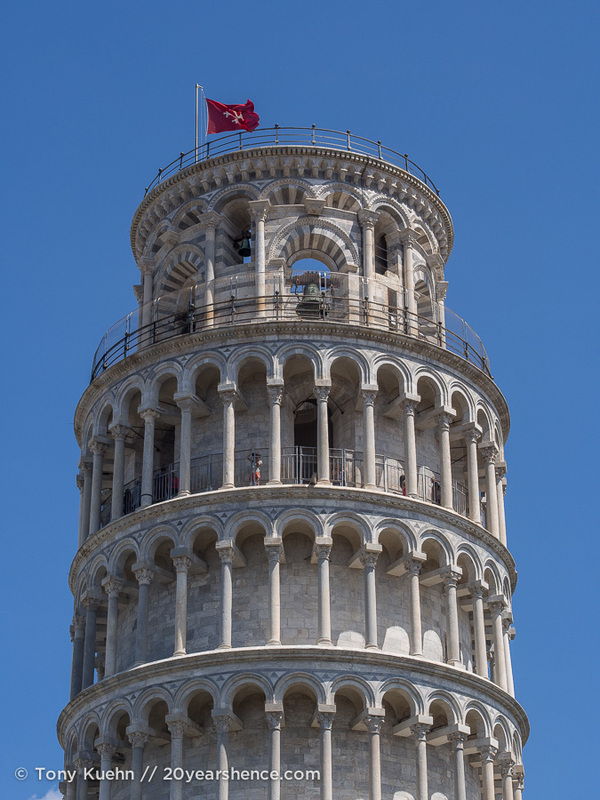 I completely agree with you about Pisa, I think we stayed there for four days in total but during our time we also visited some close by cities like Lucca and did a day trip to Cinque Terre. We liked how lively the city was probably due to the fact that it’s a student city and it helped that, whilst we were there, one of their more important festival “La Luminara” was on which was very interesting to witness and experience with our couchsurfing hosts. Overall I think that just few hours in any place aren’t enough no matter how small the town might be, but often time isn’t on our side so I understand when we have to rush through even though I don’t like doing it. I think in Pisa the chickpea fritter is called cecina? I can’t remember exactly anymore, but our CS host told us what to ask for and where to go for lunch, so we just memorized and followed her instructions. You’re right that she mentioned it being a peasant food meant for poor laborers but very nutritious (& delicious!). It was a great lunch, and unlike anything we’ve had anywhere else! Night-time Pisa is the best kind of Pisa! 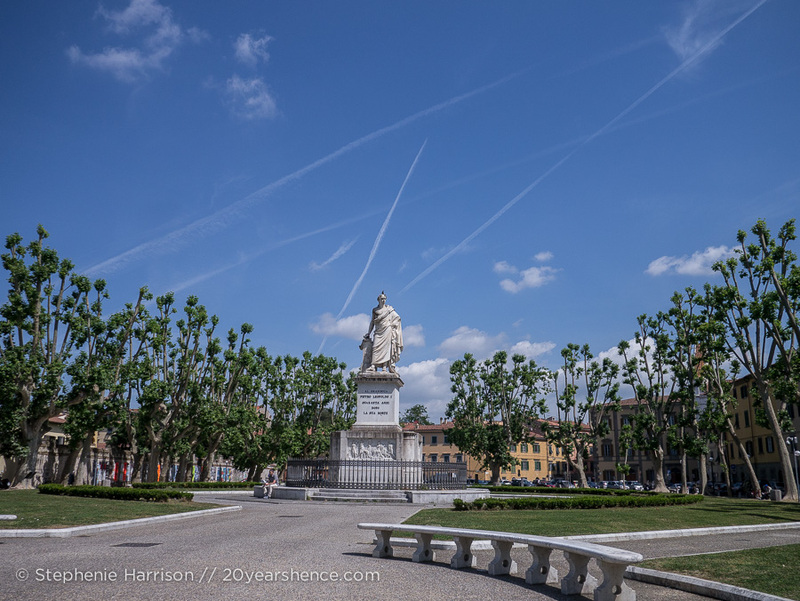 We both felt the same about the tourism circus that surrounds Pisa and the immediate vicinity of the tower so avoided it during the day and explored the city around it in much the same way. It’s really lovely away from the center, walking down the same winding streets, passing market stalls and university students chatting away over coffee. So glad you saw the part of Pisa we actually enjoyed! We did pop by the tower for an hour or two during the day, but we were able to go pretty early before the real circus began, and that was just a fraction of our time in Pisa. I’m so glad for that because, as you said, the night-time is the best time to really experience Pisa! It’s so funny how these things work out, but once again I’m so glad we decided to CouchSurf. If we hadn’t I feel we likely would have raced through Pisa just like everyone else. Instead, I’m glad we got to actually enjoy our time there & see the stuff you never read about in guide books. I think Pisa looks beautiful and charming – I definitely wouldn’t mind spending a couple of days there. I’ve only been to Rome but I absolutely loved it and can’t wait to see more of Italy one day. I’m excited to read more about your adventures there and hear all about what you ate – I think Italy is one of the only countries that I get excited by for its food! 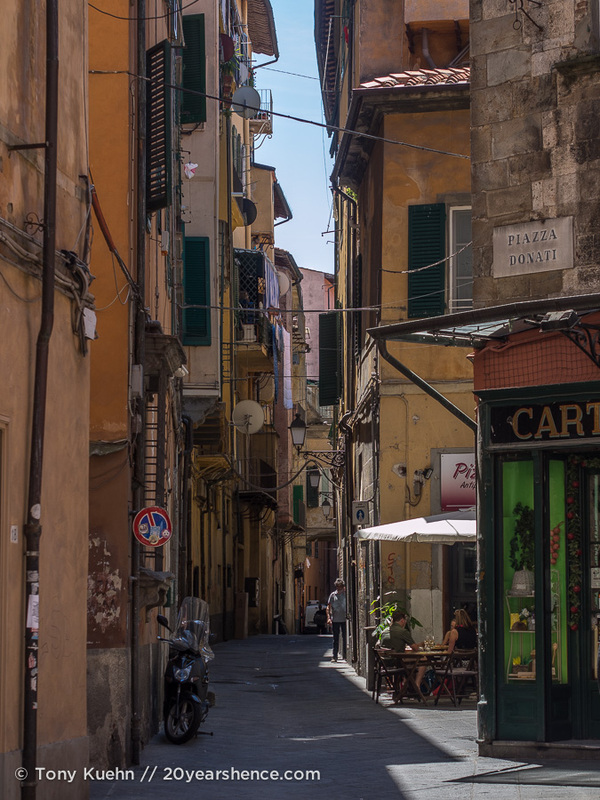 In some ways, Pisa feels like one of Rome’s smaller neighborhoods, so if you enjoyed your time in Rome, I think there is a good chance you would enjoy a short trip to Pisa. We definitely have more stories to share about the other places we visited in Italy, so I hope they’ll give you some inspiration for whenever you next find yourself in that part of the world! I really enjoyed reading your perspective on Pisa! I’ve been before on a day trip from Florence that included Sienna, San Gimignano, and a lunch stop at an organic farm/vineyard. I am very glad I got to see the Field of Miracles – yes, it was full of tourists and all, but it was still beautiful. But with that said, I almost felt like I had too much time there (and we couldn’t have been there for much more than an hour). I could have easily spent more time in the other two cities, but never would have considered more time in Pisa. I loved seeing more of the city through your eyes. And to get to see the Field of Miracles at night looks magical. I think you’ve convinced me that there’s more to the city than just what the average tourist sees. I think if all you want to see is the Field of Miracles (and you aren’t even interesting in paying the ridiculous fees to climb the tower or enter the Baptistry) then you don’t need very much time for Pisa at all, but it really was nice to have a whole day to just lazily stroll the city without expectations of what else we might uncover and see a quiet, domestic side to Italy that I think is harder to find somewhere like Florence. And really, getting see the Field at night was such a treat and such a different experience and atmosphere to a daytime visit. For that reason alone I would say spending one night in Pisa is worth it! 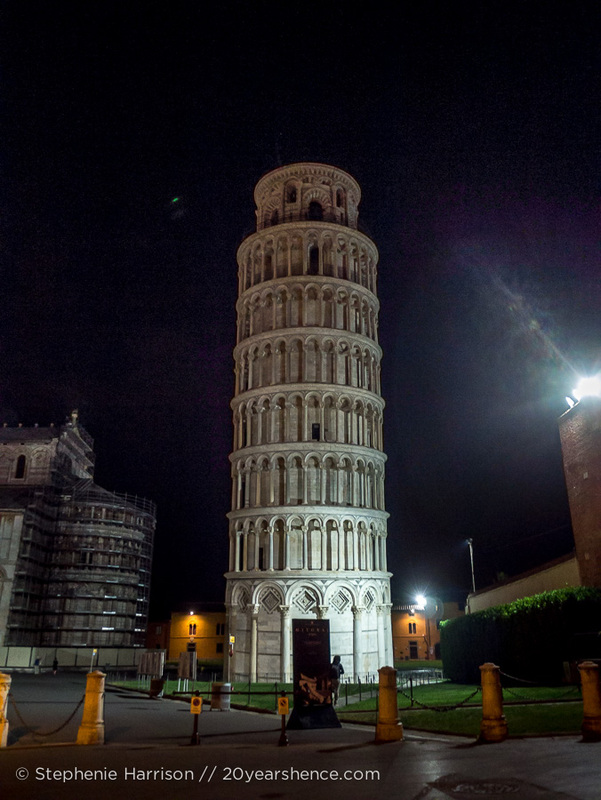 Lovely post.. the night pictures of the leaning tower are fantastic! We have just done the Pisa shuttle, 1 day on a train journey in from Florence, but have appreciated many a town around the world that is only known as a day tripping region. Once the crowds depart, that is when the magic happens. I do think, don’t you too?, that part of the reason you, and we, appreciate a town with little to “see” is because when traveling long term there is always a subtle search for feelings of home. 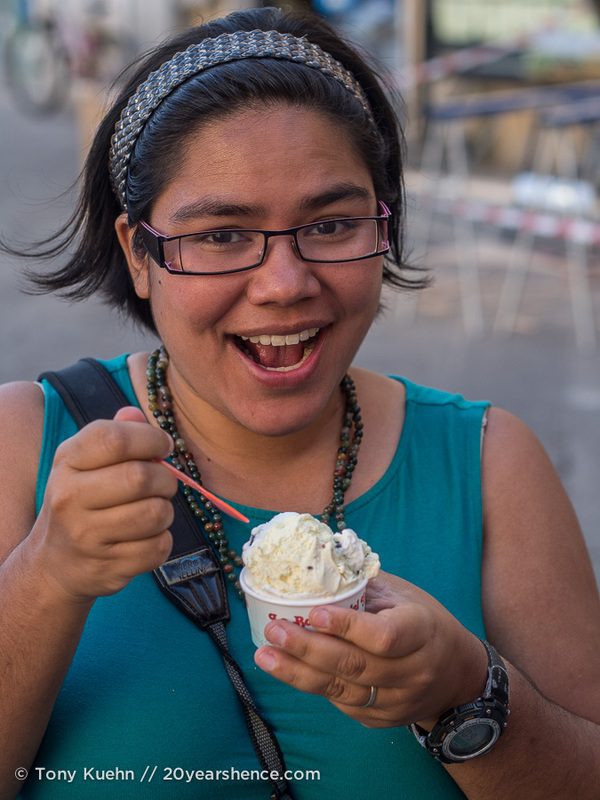 You are much more able to appreciate a small market and local gelato stand than someone with two weeks racing from must see to must see destinations. Although I do love Florence (and Paris for that matter) it seems that it is always the smaller, off the beaten path, destinations that win my heart. I agree that the small towns are generally more interesting to us as they tend to show us a side to countries that we normally don’t get from big cities. I also tend to find that, on the whole, locals tend to be friendlier/more amused by us, which makes us feel more at home too! I also agree that appreciating these smaller places is probably a luxury for those of us taking extended trips. Maybe it’s because we’re not so harried and hurried, or maybe it is because our goals and what we hope to get out of destinations is different. Either way, although I very clearly remember being a “list ticker” traveler, I can hardly imagine returning to those ways again! The place looks so good at night. The city doesn’t seem to lose its charm even after all these years. And I guess it never will. Thanks, Matt. This was our first visit to Pisa so we didn’t have anything to compare it to, but it does seem like one of those timeless places that will generally stay more or less the same. 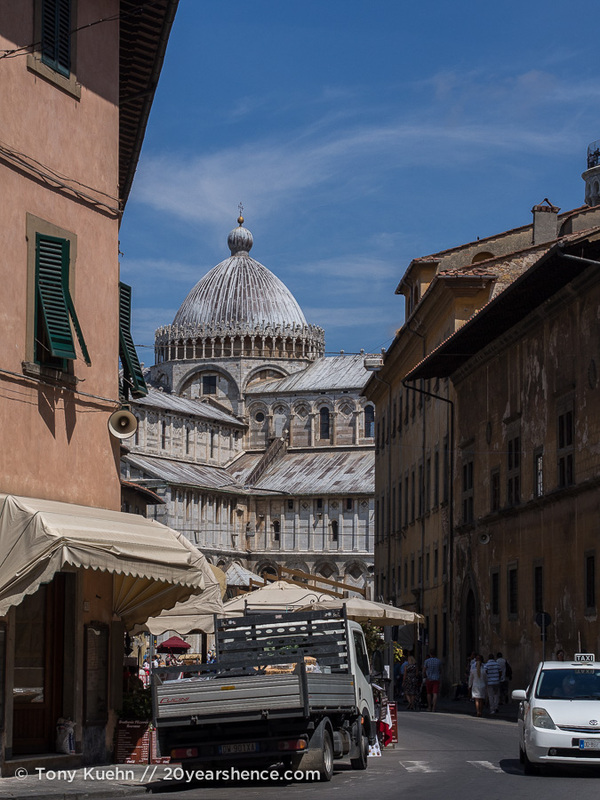 Yes, unfortunately most guidebooks really only focus on one tiny part of Pisa and make it sound like there is not really much else on offer in the rest of the city. I suppose on some level, this is true, as there aren’t any other major tourist attractions elsewhere that we encountered, but if you want to simply enjoy a real Italian city that isn’t totally devoted to tourism, then there is much to enjoy. Hi Steph, great to see your take on Pisa which is so refreshing. I’ve also never seen the tower at night before, you make it look amazing. I often hear people (even Italians) slate Pisa as a town saying there is little to do there apart from the obvious sight! Yup, even the locals we talked to in Pisa were dismissive of their town as a prolonged tourist destination. “It’s just a working class university town!” they would tell us. And it is! But for people looking for more than the standard “guide book” tour of Italy, that can be fascinating in its own right. I wouldn’t necessarily urge people to spend a week in Pisa alone (though you could pick a worse base for touring Tuscany), but I think there is certainly value in spending the night so you have time to see some of the other pockets of the city and also can take in the tower and surrounds by night, which are just spectacular! Thank you so much for this post Steph and getting Pisa a little bit more on the radar! My family and I are hard-core lovers of Italy and we constantly go to Milan and Florence. 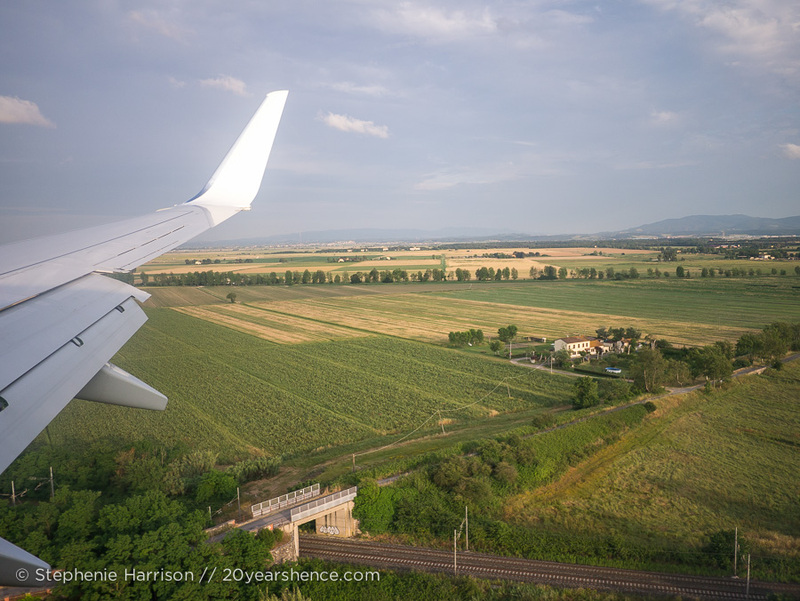 In 2012, we spent a few weeks around the region of Tuscany spreading our time around the countryside, the sea, the farms, the villas, and the villages. Pisa was our last call before returning to Germany, and the place that we decided to relax and splurge. We spent three nights here in an 1839 historical hotel that was right on the riverside. It was beautiful! 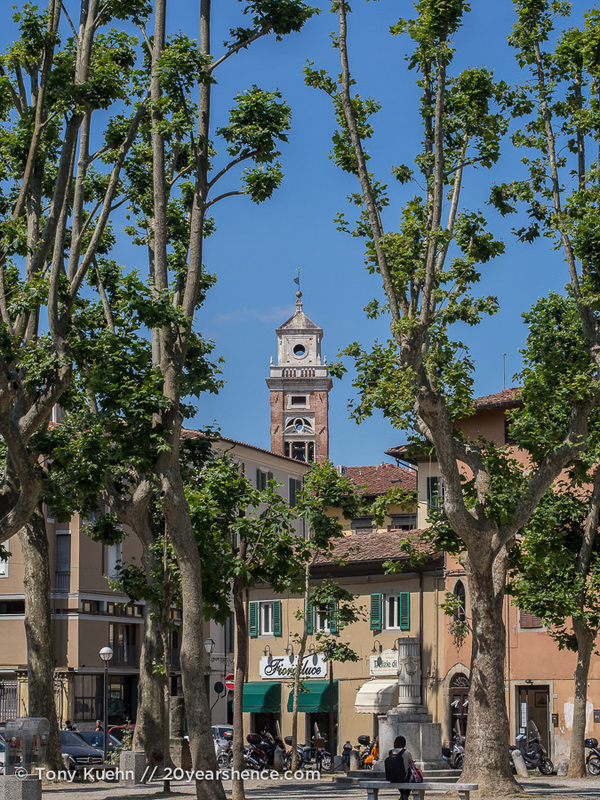 We parked our car and spent most of the time walking around ordering a variety of ice-creams, more alfresco restaurants, spending hours near the leaning tower as we also wanted to investigate the buildings around it. We even went on a historical walking tour that we had heard about! The town of Pisa is definitely more than just the tower. Oh yes! Are there any other popular day-trip cities that I believe are better appreciated with a longer visit? Yes, Brussels. Most people just spend just a day. Again, I spent a 3-day-2-night-weekend there and it certainly wasn’t enough. 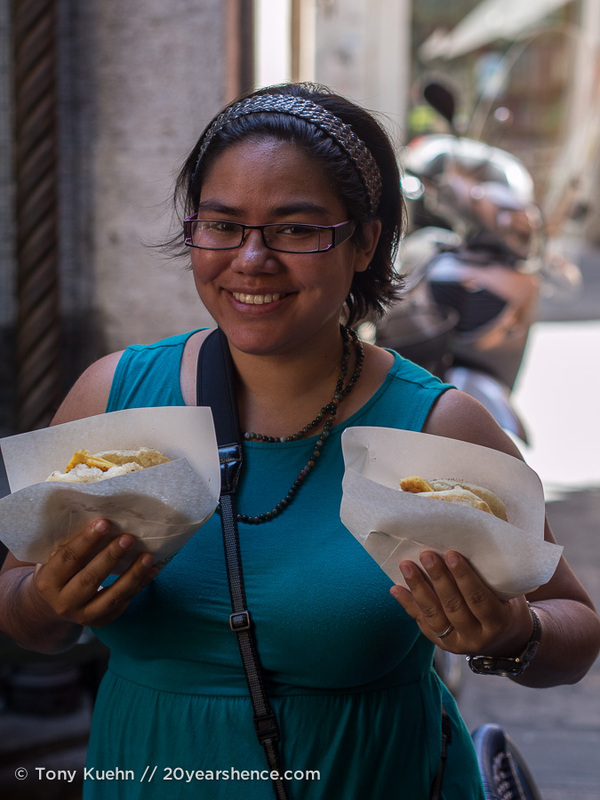 There was just so much to see: the museums, the markets, and the food. Delicious! Victoria@ The British Berliner recently posted..How I went on a bicycle tour and fell in a ditch, in Bali! I’m so glad to hear that you too have enjoyed a longer stay in Pisa! I bet that historical walking tour would have been fascinating (we got a hint of one from our CS host! ), and that’s a great way to get to know a place that I think most guide books and online guides give unfairly short shrift to. It’s such an interesting little place, especially since so many people have heard about it and do visit, but no one actually bothers to see very much of it! As for Brussels… I will take your word on it! I visited back in 2005 and was not impressed with the city, although we spent 2 nights there. I’m sure the fact that the hostel we stayed at had a bed bug infestation didn’t help matters, but apart from the food, we found ourselves underwhelmed. I left not really wanting to return BUT I recognize that I am a different person now, so perhaps I judged it too harshly and it is worth revisiting. Ever since we moved to Riga, I’ve heard about how “small and boring” Helsinki is and that a day trip from Tallinn is more than enough. So on my latest trip to Tallinn, I booked a ferry to Helsinki and gave myself all of six hours to explore the city. This was most definitely NOT enough time! The city was breathtaking and I barely scratched the surface, having time to visit just two churches and one museum. I’ll be going back for a long weekend, probably over the summer to maximize the daylight hours. In hindsight, I should never have listened to the others because I hate to feel rushed when traveling. Lesson learned! I’ve never bothered to get to Pisa but your photos have convinced me that it’s worth the drive (or flight) next time. That’s a really useful tip re the airfare from Paris. I’m always looking for cheap ways to get to Italy, and those secondary airports really are the ticket! Pisa is definitely worth a day or two, so I do hope the next time you visit that part of Italy you give it a little bit of time! When we are fairly open-ended in our travel plans, we find the site SkyScanner is quite helpful as you can do fairly broad searches like flights from Paris to Italy and it will rank all available flights during a selected day/week/month in order of cost. That’s how we discovered the cheapest place for us to fly into Italy was Pisa, otherwise we never would have considered visiting it either! This city is one of my favorite places in Italy, beside Rome, Milano, enice And Sienna, Thanks for this share , i love your pictures ! Thanks, Minh! We loved our time in Pisa, but there is definitely more of Italy that we will need to explore in the future. Would love to visit Venice & Sienna some day! Hi Stephanie, I visited the city during my first visit to Italy more than a decade ago and had no interest to go back. But thanks for showing us the charm of Poor Pisa outside the “tourist hours.” I have never seen a night shot of the tower and cathedral. It looks so atmospheric, grander and peaceful without the crowds. You inspire me to return and experience its beauty miunus the crowd. 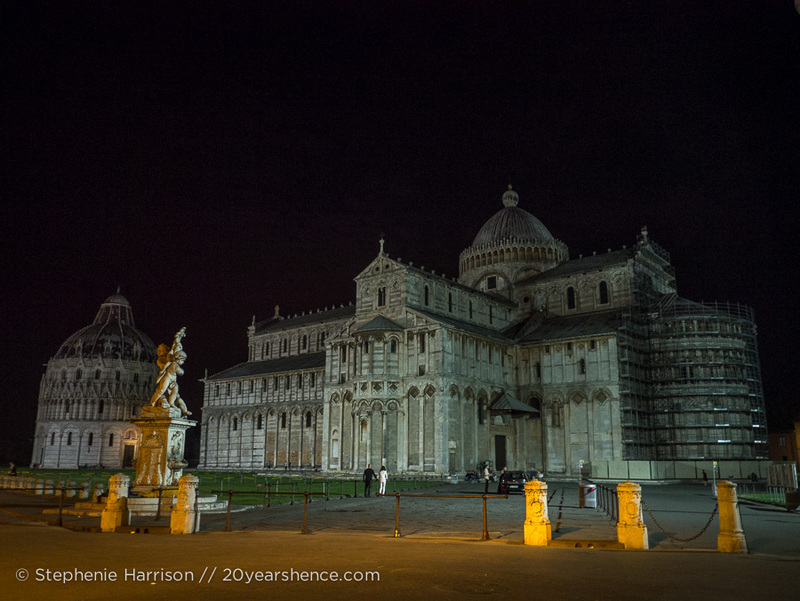 It really is remarkable how different Pisa is at night… like night & day! 😉 I would never say people should go and spend weeks there (unless they want a really quiet, low-key few weeks! ), but I think at least one night is worth the time because getting to see the tower and the city when it is quiet and lit by moonlight is just so magical. I’m glad we could offer you a new perspective on the city, and perhaps entice you back for a repeat visit some day! Pisa actually looks like a beautiful place to spend time, even though the locals were telling you to explore elsewhere. Those buildings are gorgeous and it’d be way nicer to enjoy them without the throng of other tourists around! Plus these photos, so pretty. 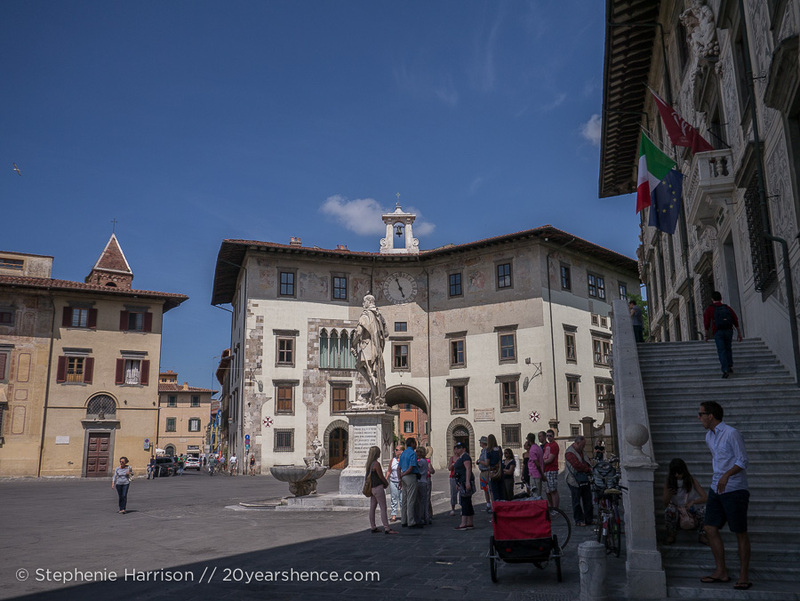 I suppose I shouldn’t be so surprised that Pisa wound up delighting us so much because, as much as we love big cities, it always seems to be the smaller, more local towns and cities that really capture our hearts when we travel. I get that well-touristed places tend to be popular for a reason, but I often think they give a very superficial sense of what a country is really about. 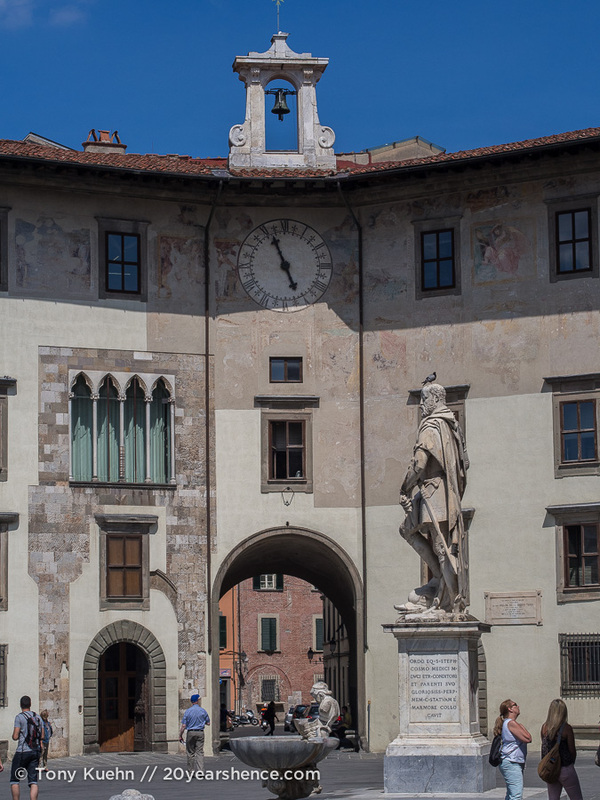 Although you’d think Pisa would just be a glorified tourist trap, that is just a very small part of the city, which is otherwise shockingly run-of-the-mill for Italy. It’s a pretty city even if it’s not preening for the tourists and I do think it’s a shame it gets such short shrift from most tourists! When I went to Pisa all the way back in 2005, it was a quickie. My travel partners and I ditched our bags at a storage locker in the train station and marched to the tower, took pics, had ice cream and hightailed it out of there. There was no real need for the rush apart from having a somewhat tight timeline for one of my friends. I would definitely go back. 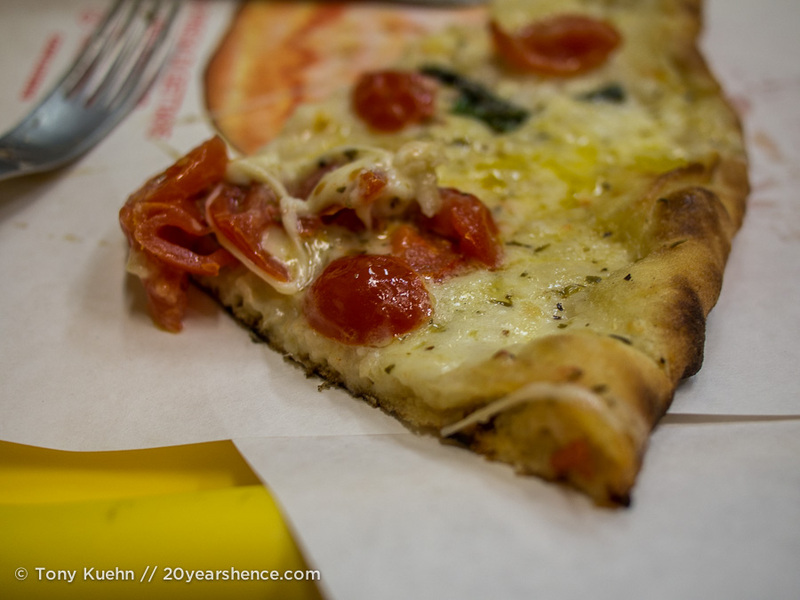 It sounds like this was the quaint Italian vibe that was missing in Florence. The food looks phenom too! Easter Island is a place I’ve visited that a lot of people don’t give a proper chance – I was there for 9 nights, and this surprised a lot of locals. They told me that most tourists come for a couple of nights, see the moai and peace out. I only started to feel like I was getting a grasp on the place after 4 or 5 days. I only wish I could have stayed longer. And my friend Kathy (who I’ve written about on the blog lots) changed her flight every week to stay a total of something like 10 or 11 weeks. She was going to the library and doing some pretty intrepid research. 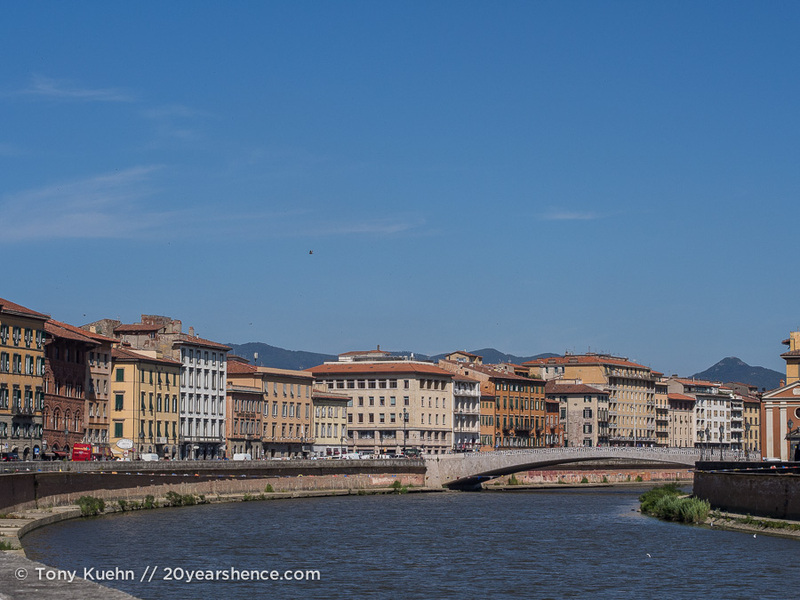 Florence certainly has its own charm and personality, but Pisa definitely felt more down-to-earth to us and I think that’s why we ultimately liked it more. It didn’t feel like it was all that concerned with tourists, and having previously spent weeks in London & Paris, that was really refreshing. Once you get away from that one square with all the famous buildings, it’s pretty incredible how quickly the city just becomes a small Italian town, which we found fascinating in its own right. Love the story about Easter Island! I can’t imagine only hopping over for a few days before leaving, since it seems like it’s such an effort to get there, but for travelers I suppose time is really the ultimate luxury. I completely agree that even in the most obvious destinations, it generally takes a couple of days before you really get into a groove and begin to notice/understand more than the most superficial layers of a place. Often, the more time you invest in a place, the more you get in return.